U of M AFSCME workers rally, march against attack on health care | Fight Back! Minneapolis, MN – More than 100 University of Minnesota AFSCME workers came together for a spirited march and rally here, August 5. After rallying in front of Morrill Hall, the administration building, workers headed upstairs to the office of President Kahler to deliver about 1300 signed petitions demanding the university drop proposed changes to the health care plan. The administration’s proposed attack on the health care plan would have some workers pay more premiums and significantly increase out of pocket medical costs for all university employees. President Kahler left his office shortly before the workers arrived, so the petitions were delivered to a staff member. Chanting “Hey, hey, ho, ho, cuts to health care have to go,” workers then marched to the Donhowe Building which houses officials responsible for human resources and employee benefits. 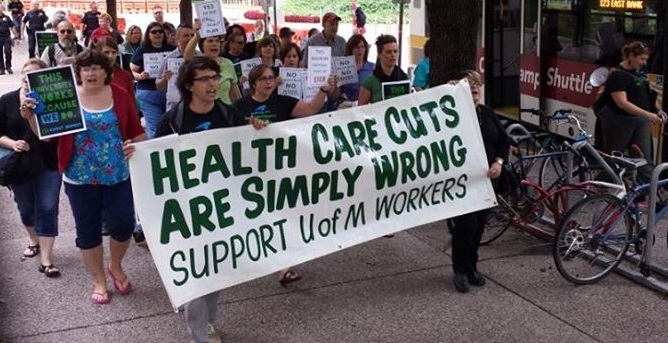 University workers, represented by AFSCME Locals 3800, 3937 and 3260, insist that the University of Minnesota drop proposed changes they claim are necessary due to provisions in the Affordable Health Care Act, and instead adopt a more equitable sliding scale plan. “The university administration is using the Affordable Health Care Act to propose changes to our health care plans that will shift costs to employees and significantly raise out of pocket costs, particularly for people with chronic health issues. It is another example of the university administration’s decision-making that deliberately shifts costs to the most economically vulnerable workers at the U,” says AFSCME Local 3800 President Cherrene Horazuk. All university employees would face increases in deductibles and co-pays if the changes proposed by the administration are followed through. Workers on the employee plus spouse/domestic partner benefit tier would see premium increases ranging per pay period from $22 to $35.80, depending on their plan. Co-pays would increase from $15 to $25, and there would be a $100 deductible added. These cost shifts are devastating to the university’s lowest paid workers, while being a negligible increase for those making hundreds of thousands of dollars a year. AFSCME Locals 3800, 3801, 3937, and 3260 represent clerical, technical and health care workers at the University of Minnesota.